As the foundations that supported an expansive centralized State crumble, the entire centralized State is revealed as unsustainable: we have reached Peak Government. In previous entries this week, I have detailed the profound unsustainability of government pensions and entitlements such as Medicare. These are symptoms are a larger phenomenon: Peak Government, the realization that Central States cannot sustain their current budgets or future promises. Most informed people are familiar with the concept of Peak Oil, but fewer are aware that we’re also entering the era of Peak Government. The central misconception of Peak Oil -- that it’s not about “running out of oil,” it’s about running out of cheap, easy-to-access oil -- can also be applied to Peak Government: It’s not about government disappearing, it’s about government shrinking. Central government -- the Central State -- has been in the expansion mode for so long that the process of contracting government is completely alien to the nation, to those who work for the State, and to those who are dependent on the State. Thus we have little recent historical experience of Peak Government and few if any conceptual guideposts to help us understand this contraction. Peak Government is not a reflection of government services or the millions of individuals who work in government; it is a reflection of four key systemic forces that drove State expansion are now either declining or reversing. The twin peaks of oil and government are causally linked: central government's great era of expansion has been fueled by abundant, cheap liquid fuels. As economies powered by abundant cheap energy expanded, so did tax revenues. Demographics also aided Central States’ expansion: as the population of working-age citizens grew, so did the work force and the taxes paid by workers and enterprises. The third support of Central State expansion was debt, and more broadly, financialization, which includes debt, leverage, and institutionalized incentives for speculation and misallocation of capital. Not only have Central States benefited from the higher tax revenues generated by speculative bubbles, they now depend on debt to finance their annual spending. In the U.S., roughly one-third of Federal expenditures are borrowed every year. In Japan -- which is further along on this timeline, relative to America -- tax revenues barely cover social security payments and interest on central government debt; all other spending is funded with borrowed money. The fourth dynamic of Central State expansion is the State’s ontological imperative to expand. The State has only one mode of being, expansion. It has no concept of, or mechanisms for, contraction. 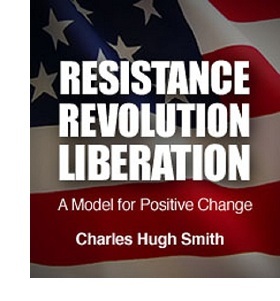 In my book Resistance, Revolution, Liberation: A Model for Positive Change, I explain this ontological imperative in terms of risk and gain. From the Central State’s point of view, everything outside its control poses a risk. The best way to lower risk is to control everything that can be controlled. Once the potential sources of risk are controlled, then risk can be shifted to others. Put another way, once the State controls the entire economy and society, it can transfer systemic risk to others: to other nations, to taxpayers, etc. In effect, the State’s prime directive is to cut the causal connection between risk and gain so that the State can retain the gain and transfer the risk to others. The separation of risk from gain is called moral hazard, and the key characteristic of moral hazard can be stated very simply: People who are exposed to risk and consequence act very differently than those who are not exposed to risk and consequence. Every time the Central State guarantees something, it disconnects risk from consequence and institutionalizes moral hazard. To take but one example of many, when the Central State guarantees mortgages so lenders and originators cannot lose and the borrower can’t lose more than his modest 3% down payment, then everyone in the chain is encouraged to pursue risky speculations because the State has disconnected risk from the consequence of a potentially large loss. The risk hasn’t vanished; it has simply been transferred to the taxpayers, who absorb the inevitable losses that result when speculation is encouraged. Separating risk from gain inevitably generates systemic instability. The entire credit-housing bubble can be seen as proof of this dynamic. The key energy source of global transportation, liquid fuel, is no longer cheap and easy to access. The demographics have reversed as the population of State dependents is soaring. Debt has expanded to the point that servicing that debt now threatens the financial stability of the State and its currency. The State’s separation of risk and consequence is generating systemic instability. There are plenty of models of State expansion -- democracy, socialism, communism, theocracy, and so on -- and none for State contraction. This suggests that the down slope of Peak Government will be disorderly and rife with unintended consequences. The predominant Western model of governance assumes, incorrectly, that a “separation of powers” within the State will limit the State’s appetite for control. But rather than limit the State’s expansion, the State’s subsystems -- the institutions of executive power, legislative power and judicial power -- are competing to gain as much control as possible over both the State itself and the nation’s social and financial systems. This competition doesn’t weaken or limit the State; rather, it lends the State a fearsome competitive advantage, as each institution gains power as the State expands. So even though the competition between the three may appear to limit the power of each, in aggregate this competition only increases the State’s expansion as each seeks to outdo the others in reach, influence, and power. Regardless of which institution wins or loses a particular squabble, the State inexorably expands its control and power. And just as inexorably, elites within the State -- systemically protected from the risk created by their policies -- will experience a rising sense of omnipotence as their private power rises in tandem with the State’s expansion. These powers also offer State elites a way to radically lower their own risk and dramatically increase their private gain by leveraging the State’s vast powers to their own private benefit. In other words, not only does each agency and branch of the State seek to expand its reach and power, so, too, does every individual within the State who can leverage the power of the State to protect his/her own individual gain. The Central State is granted unique powers of coercion by its membership (the citizenry) to protect them from the predation of foreign powers, individuals, and subgroups seeking monopoly. The citizens grant the State this extraordinary power to protect their freedom of faith, movement, expression, enterprise and association and to insure that no subgroup can dominate the nation for their private gain. Granting this power to the State creates a risk that the State itself may become predatory. To counter this potential, the State has the self-limiting mechanisms of a separation of powers such that no one institution or agency can dominate the State and thus the nation. But as we have seen, the separation of powers has failed to limit the expansion of the State; rather, it has become a competitive advantage, feeding the State’s expansion. There are no State-based limits on the State’s concentration of wealth and power. There is a great irony in this concentration of power in the State: the power is concentrated to protect the citizenry from predation and exploitation, but that concentration becomes an irresistible attractor for all those seeking to increase their private gain via monopoly, cartels, collusion, fraud, and other forms of predation. The wealth that can be concentrated in private hands is not limited or self-regulated, and so private concentrations of wealth inevitably exceed the ethical threshold of individuals within the State (i.e., their resistance to bribes and self-interest). This structural imbalance leaves the State intrinsically vulnerable to the influence of private wealth. Once this wealth has a foothold of influence within the State, it can then bypass the State’s internal controls and become the financial equivalent of cancer: a blindly self-interested organism bent solely on growth at the expense of the system as a whole. Rather than protect the citizens from exploitation, the State’s primary role becomes protecting the private gains of elites who have taken effective control of the State’s vast powers. We can now see that the Central State faces an impossible contradiction: to pursue its primary purpose of protecting the citizenry from predation, it is granted powers that enable it to evade its own self-limiting mechanisms. Private concentrations of wealth gain control over the State’s machinery of governance, and the resulting partnership of private and State elites suppress the mechanisms that were intended to limit private influence over State power. To enhance their own power, these elites increase the State’s reach until it dominates the entire political, social, and economic system. This sets up an inherently self-destructive feedback loop in which the State’s actions to protect its self-serving elites weaken both the State and the nation. The State’s inefficiencies pressure the nation’s output, even as the State increases its share of the national income to maintain its self-serving elites and quiet its potentially restive dependents. The more the State expropriates, the less surplus is left for productive investment, and so the nation’s output continues to decline. This dynamic creates a positive feedback loop (i.e., a death spiral) of higher taxes and lower investment in productive assets. In Part II: The End of the Free Lunch, we consider what citizens can do to limit their own risk as the Central State contracts. We explain how the State has unfairly used taxpayer-funded subsidies to erode participation commerce and investment at the local level that in ages past provided transparency into the true value of labor. Now that the artificial influence of these subsidies is waning as the State can longer longer afford them, reactivating the infrastructure and processes for enterprise at the community level will be critical to transitioning to a sustainable and more resilient economic model. This essay was first published on chrismartenson.com. Warm the hearts of your family while cooling the planet--plant a garden! : largest discount ever from Everlasting Seeds. It's the perfect time to start your veggie/herb garden, and Everlasting Seeds is offering oftwominds.com readers 15% off all products:Buy a Vegi-Max and share with friends! Thank you, Anonymous from Canada ($150), for your staggeringly monumental generous contribution to this site-- I am greatly honored by your support and readership.